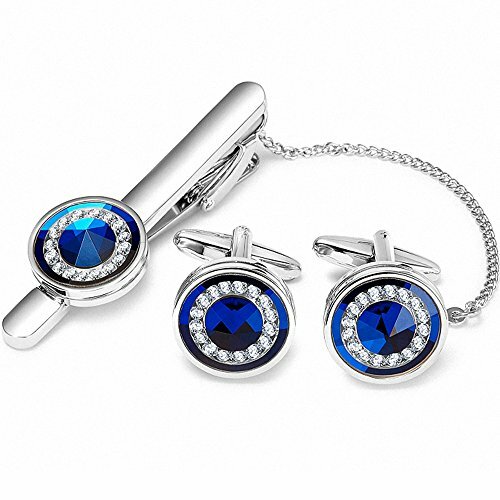 This three piece set features a Blue Ring crystal tie clip and matching cufflinks. It is Timeless Design-Classic and Fashionable Gift for every gentleman, this set will lend masculine style and sophistication to any formal outfit. The fashion jewelry looks like fine jewelry.so they are very popular in the contemporary.However, the material is just the base metal/alloy with 3 times of white steel plated,the jewelry color will not maintain longer than the fine jewelry in your daily wearing. 3.Please avoid contact with Perfume, Body Lotion, Hairspray or any other Chemical that May Harm the shine of the metal. 4.Every day off with cotton soft cloth to wipe surface clean, put into box is better. UNIQUE DESIGN: Big blue crystal with small white crystals ring in it, Conical polyhedron design,cufflinks and skinny tie clip make you distinguished. PRODUCT SPECIFICATION: Diameter of Round cufflinks is 0.67inch, tie clip length is 2.17inch. PERFECT GIFT: For Fathers day, Christmas, Graduation, Boss's day, Business man, Groom, Usher, Father of the bride, Wedding party gifts,etc.Also great for boyfriend, dad, brothers to collect. If you have any questions about this product by BagTu, contact us by completing and submitting the form below. If you are looking for a specif part number, please include it with your message.